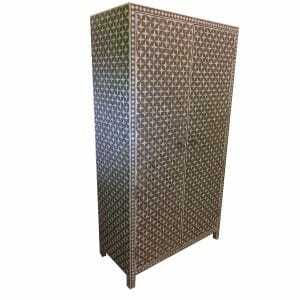 Where can I find Indian Mother of Pearl Inlay Furniture in England? 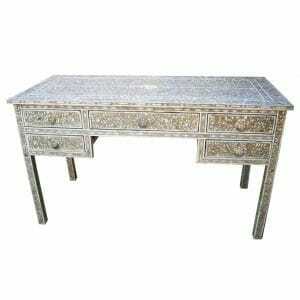 On these pages you’ll find one of the most impressive collections of genuine Indian mother of pearl inlay furniture that can be found anywhere online and in Great Britain, plus we deliver anywhere in the UK. 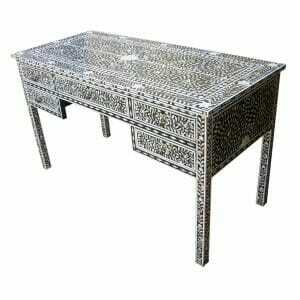 Here you can peruse our exquisite range of mother of pearl inlay furniture. 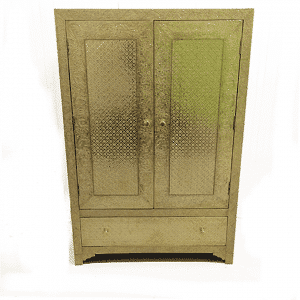 We have wardrobes, dressers, mirrors, desks and much more, all ideal for refitting a living room, dramatising a study or softening a bedroom with iridescent opulence. 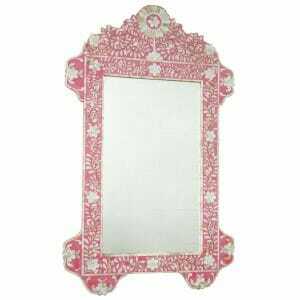 Each of these pieces has been hand crafted by our talented Rajasthani artisans, so each is one of a kind, eye-catching and built to last for generations. 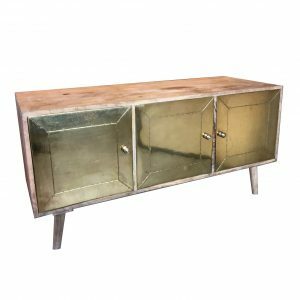 Fashioned with skilled carpentry and solid woodworking joints, decorative art adorns solidly constructed furniture, for a winning combination of strength as well as beauty. Incredibly versatile colourways blend beautifully with any and all interior décor schemes, from the plain and neutral to the sophisticated and the elaborate. Choose from a huge array of stunning colours, sizes and unique designs – you’ll be sure to fall in love! 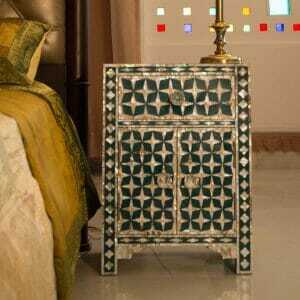 When you've chosen your perfect piece of Indian Inlay furniture, we arrange the ideal delivery slot with you and a hand crafted piece of original Indian artistry ends its long journey from the hands of the master craftsmen at the gateway to the Thar desert, across the high seas, to your door, ready to begin its new life as a luxury addition to your home, lending a regal flavour to your furnishing. 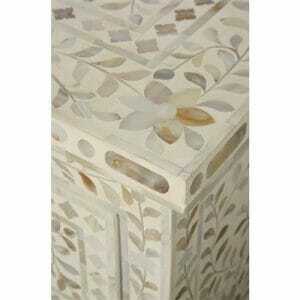 Will Indian Mother of Pearl Inlay go with my décor? 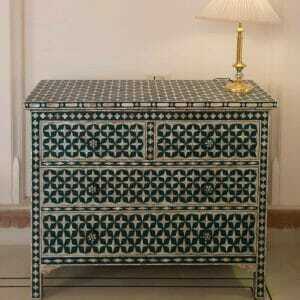 Our gorgeous Indian mother of pearl inlay furniture can be purchased in a range of magical colours and patterns, so whether your taste in décor leans toward the stylishly neutral or the bold and bright, our versatile range of Indian mother of pearl furniture has something to suit every personality. 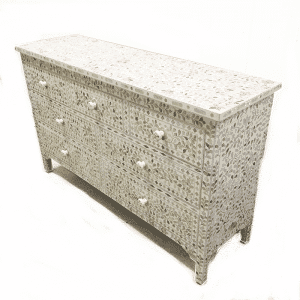 For an elegantly understated look, consider our white mother of pearl chest of drawers, which looks stunning paired with our white square mother of pearl mirror. 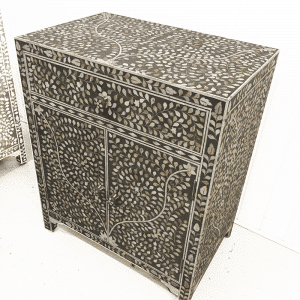 Both pieces feature the romantic floral patterns of vines and leaves that decorate the surface of hardwood with iridescent nacre. 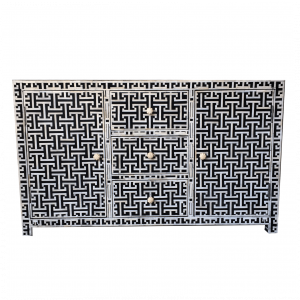 Mother of pearl inlaid in a white background creates the subtlest of combinations, with soft hints of iridescence catching the light as it changes or you move. 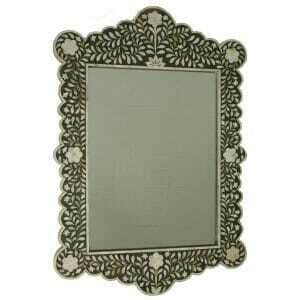 This sophisticated combination suits grey to neutral décor, giving a refined finish, sparkling with understated class. 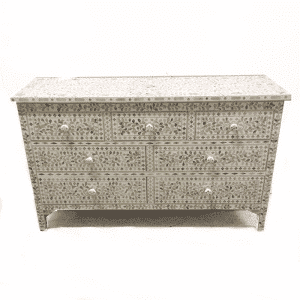 If your preference is for the soft feminine hues and you're decorating in pink, the pink mother of pearl two drawer chest melts beautifully into a room and suffuses the décor with sumptuousness. 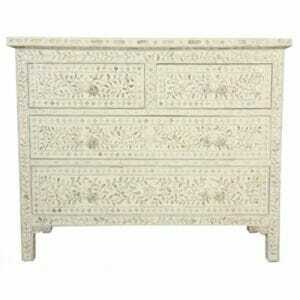 Smaller than our larger, four-drawer chest of drawers, this regal mother of pearl inlay chest adds a touch of softness to the bedroom. 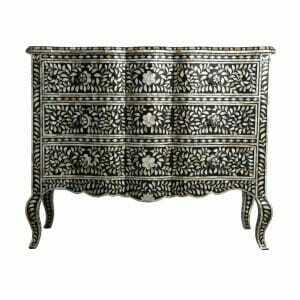 Indian furniture is incredibly versatile with its wide range of decorative combinations, from the subtle to the high contrast. 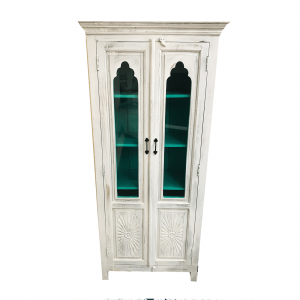 You can infuse neutral décor with a delicate shimmer and choose from our natural to neutral combinations, with white and grey mother of pearl furniture looking stunning against grey walls. 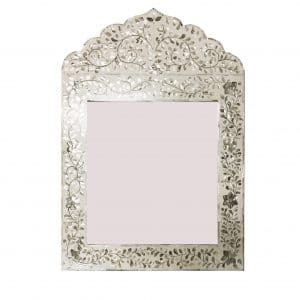 Define your style by opting for a floral design where soft lines and subtle detail can add a hint of elegance or choose defined geometric patterns for a clear, crisp aesthetic, so that a flourish of oriental magic can be introduced into any room. 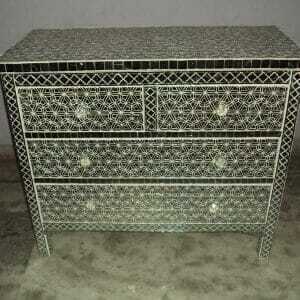 Who makes Indian Mother of Pearl Inlay furniture? 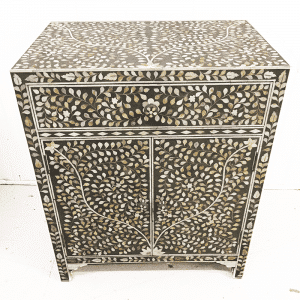 Whatever style of Indian furniture you desire, our luxurious line of mother of pearl inlay furniture features some of the very best authentically Indian craftsmanship that can be found anywhere in the world. The gorgeous and delicate mother of bone fragments have each been carefully hand selected, shaped and polished to fit perfectly with the piece. 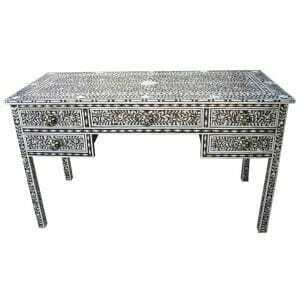 The woodworkers who create these magnificent products are all based in Rajasthan, the fabled land of maharajas and stunning white palaces. 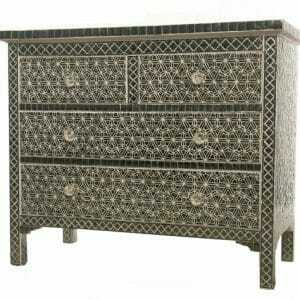 Indeed, the luxurious, antique furniture that line the cavernous rooms of these palaces were made with the same techniques used to make the furniture you’ll find on these pages and in some cases by the same master craftsmen! 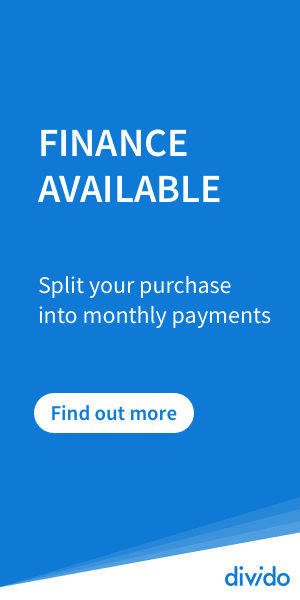 Each item we offer is unique and made to the highest quality, so you’ll be proud to feature it in your home for years and years to come. 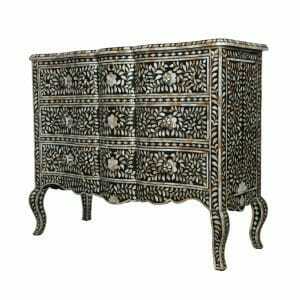 Using an alchemy of traditional and modern carpentry, artisans inheriting their skill from an established lineage of master craftsmen re-inspire themselves daily to adorn mother of pearl inlay furniture with beautiful new examples of Indian art in the workshops that are home to constant creating, to bring new and unique inlay designs to you alongside the more traditional, timeless fashions that define the art of their region. 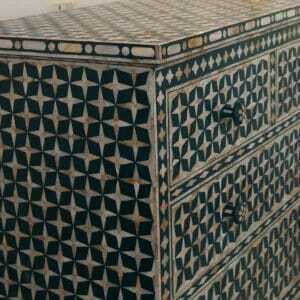 How Can We Help With Bespoke Indian Mother of Pearl Inlay Furniture? 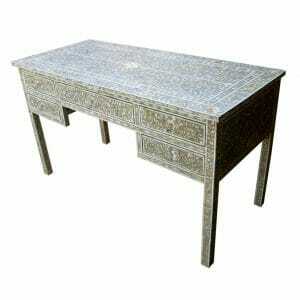 Please peruse our catalogue of exquisite mother of pearl inlay furniture to find the ideal centrepiece for your home. 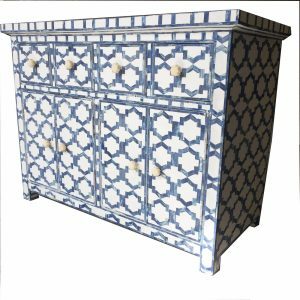 All of our furniture can be ordered in a range of stunning colours, perfect for a feature piece in a bedroom or a space filler in a hallway and we are always happy to place bespoke orders for custom sizes for those hard to fit places. 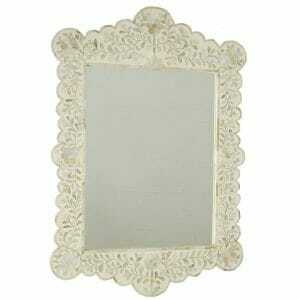 Don’t hesitate to contact us if you can’t find what you need, and we’ll draw up a custom quotation right away. Finally, at Iris Furnishings we are always committed to raising the standards of fair trade and environmental sustainability in the furniture industry. All of our furniture is crafted only from sustainably-grown, renewable plantations of Indian mango and sheesham trees, harvested and regrown in line with India's extensive reforestation guidelines. We personally ensure that all of our craftsmen receive more than fair wages and working conditons by visiting our workshops regularly. Meeting our woodworkers and suppliers face to face allows us to be certain that our ethical standards are maintained and that our furniture is consistently of the highest quality.